For many people, getting out into nature is all about experiencing silence – or the sounds of the wind, birds, and crickets. However, does it have to be that way? Don’t you wish you could listen to your favorite tunes while chilling at camp? Technology has given us many camping comforts that may not exactly be primitive, but make our experience way more enjoyable (like, say, sleeping bags). In this case, the best waterproof Bluetooth speaker might just be your next best purchase. Portable speakers let you take your favorite musical experience anywhere with you, and that includes camping, backpacking, hiking, and rafting. However, choosing a portable speaker might be easier said than done, considering the number of models and brands out there. Don’t worry because you’ve come to the right place. In this article, we will walk you through some of the best factors to consider when buying portable speakers. Plus, we’ll go over some of the best speakers you can buy so that you can enjoy the great outdoors without the silence. Let’s get to it! Before you buy your next portable speaker, there are a few things to consider. Since this article is about Bluetooth speakers, we’ll focus on the features specific to the wireless variety. The first thing to consider when choosing your perfect speaker is its maximum volume. Pretty much every speaker is going to boast that its loud, but a savvy shopper should know how to differentiate between a powerful speaker and one that doesn’t pack quite as much punch. When looking for a loud and powerful speaker, look for specs on the sound itself. These specs include the wattage (expressed as W), the number of bass radiators, and the ability to adjust the equalizer settings. All of these specs indicate that the speaker was made for higher-quality sound. While clearer sound is always a plus, louder isn’t always better – especially outdoors. If you plan to take your speaker into any wilderness area, remember your Leave No Trace principles! While you may enjoy the new Taylor Swift single, other visitors in the area may not, and the local wildlife definitely won’t. You want to keep your music at a level of quiet that matches your surroundings, and avoid the urge to pump the bass in areas where noise pollution is unwelcome. In these kind of scenarios, other qualities might take priority over loudness. Our next consideration with wireless speakers is the battery life. In the city, a long battery life can be nice, but a short one is no more than a minor inconvenience. In the backcountry, however, a short battery life means that your accessory becomes useless a lot more quickly – and won’t become useful again until your return home. When looking at battery life, keep in mind that most listed lifetimes aren’t measured at max volume. If you plan to keep the music down, like around the campfire with a few friends, then the rating will probably be pretty accurate. If you plan to blast it, however, like on the river during a float trip, then you’ll want to factor in a much shorter battery life. When calculating your battery needs, consider not only the length of your trip, but how often you plan to use your speaker. It might seem tempting to get a 24-hour battery for a multi-day backpacking trip, but think first – how many hours of down time will you really have? If your trip is strenuous, with only a few exhausted hours at camp each night before bed, you might not need that much power. If your trip is more leisurely, plan on a bit more energy. Since this article covers waterproof speakers, we have to take a look at waterproof rating. While many speakers claim to be waterproof in the title, not all water resistance gadgets are made the same – and not understanding the label can mean the difference between hours of jams and a short-circuited piece of junk. Electronic devices are rated for water resistance using an IP scale. Common numbers you might see are IPx5, IP67, and IPx7. The first number after the IP, often replaced by an “x”, represents the device’s resistance to solid particles like dust. The second number is the actual water resistance – and the one we’ll pay attention to here. A device with an IPx5 rating has some water-resistant features – it can handle splashes and a bit of rain just fine. But beware, although this rating is laboratory-tested to withstand some shallow submersion, in practice, these speakers aren’t going to hold up too well to a puddle, river, or pool. IPx7 or IP67 devices, on the other hand, are made for water. These devices are submersible to up to 3 feet for half an hour – so you can take them out in rain or shine without a worry. The next thing we’ll take a look at is weight. Like all backpacking gear, weight is an important thing to consider with Bluetooth speakers, and, like all backpacking gear, it varies a lot. Wireless speakers can be big or small, bulky or compact, and ultralight or ultra-heavy. When deciding on your ideal speaker, make sure to factor in weight. Certain models are perfect for backpacking – they’re small, compact, and weigh under one pound. These speakers, however, generally aren’t as powerful and often have shorter battery lives than the bigger ones. Their opposites have big, clear sound – but they can weigh as much as four or five pounds, and that might be too much for the backcountry. These speakers are better suited for car camping, rafting, and day trips. Our final consideration for our speaker selection is the controls. This last item has a few parts, so we’ll go over them one-by-one. First, controls refer to the actual, well, controls. Speakers run the gamut from minimalist design to overrun with buttons, and depending on your activity, either one can be the best option. For wet activities or things like climbing, speakers with a control interface are the best to avoid pulling out your phone. The second piece of this consideration is the ability of speakers to connect with others. Many speakers offer the option to connect with either the same type of speaker or any other speaker of the same brand to create surround sound or increase the volume. Additionally, some speakers can connect with multiple devices simultaneously to allow you and your friends to trade off songs. This can be great for bigger groups or more social situations. These five things are just a few of the considerations you can look at before you make your purchase – but they’re some of the most important. Think about your needs while you look through our favorite speakers below! Now that we’ve gone over some of the things to look for in a Bluetooth speaker, lets get into the products! Description: JBL is a big name when it comes to speakers. The JBL Flip 4 Bluetooth Speaker is the perfect, all-around entry into the world of portable speakers. This simply-designed, sleek speaker comes in several different colors and packs easily into any backpack bottle pocket or cup holder. The IPx7 rating means this little device is fully waterproof, so no worries in rain, snow, or shine – or even on the lake or river. Not only is this speaker well-designed on the exterior, but its interior design is high-quality, too. The Flip 4 features two external passive radiators for powerful sound and powerful bass in stereo that will make your tunes sound great in all settings. Link up with up to two phones simultaneously to take turns playing your favorite songs with a speaker that packs a lot of bang for not a lot of bucks. Definitely a solid speaker for outdoor adventures. 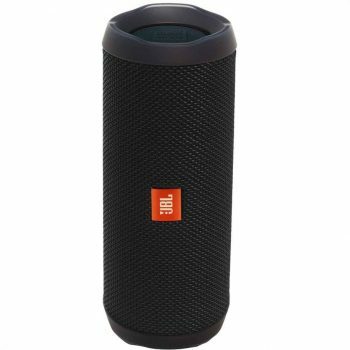 Related: For another JBL speaker with high-quality sound, check out the JBL Pulse 2 Bluetooth Speaker, a water-resistant speaker with a built-in lightshow, perfect for a night under the stars. 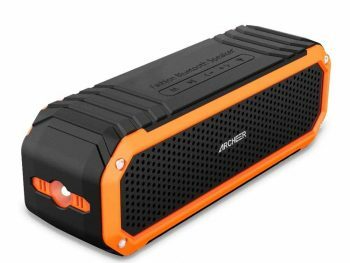 Description: For those who thrive on utility, the Archeer A226 Bluetooth Speaker is a gadget you can feel good about packing on your next adventure. This lightweight speaker packs easily into your gear or hangs off it with the included carabiner, and comes with a built-in flashlight to help you navigate, set up camp, or tell spooky stories with extra effect. Although the A226 is only rated at IP64 and can’t withstand submersion, it is suitable for outdoor use and is splash resistant. It features a 12-hour battery life and call capability, so you’ll never have to interrupt your connection to take a call. Arguably, the best part of this speaker is the very low price which is only over $20. However, it’s still packs a lot of features and utility. This is a great, affordable option for backpackers who want a more practical tool to meet their musical needs. Related: For an even lighter and more compact speaker, check out the Archeer A106 Bluetooth Speaker. This small, clip-sized speaker packs a surprising punch without taking up too much space in your pack. 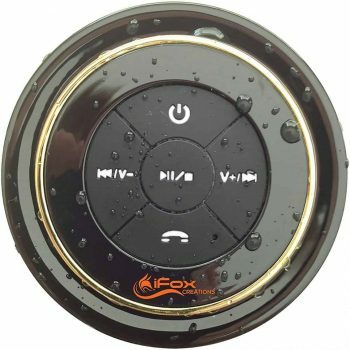 Description: If you like the water as much as you like your music, the iFox iF012 Bluetooth Shower Speaker is the item for you. This suction-cup speaker is IP67 rated and fully submersible – and it’s made for the water. Complete with a build-in suction cup for showers or dashboards, this ultra-lightweight speaker packs a surprising amount of sound into its small package and allows you to have worry-free tunes throughout all types of weather and activities. While the iF012 may have a shorter battery life and a little less of a powerful kick than some of its larger competitors, its size and ease of use more than make up for it. This product is perfect for rafters, canyoneers, and backpackers who are less concerned with acoustics and more concerned with having a speaker that is sure to work wherever they go. The price is quite affordable too so it’s hard to go wrong with this one. Related: For even more versatility, take a look at the iFox IF013 Bluetooth Speaker, the same great style of waterproof speaker with included FM radio. Description: The Ultimate Ears BOOM 2 Phantom Bluetooth Speaker is the ideal for audiophiles who want big sound under the big sky. This attractive, minimalist-design speaker is heavy on the features and heavy on the sound – and music fans won’t be disappointed. This speaker is a party-pleaser and is available in multiple colors, connects to three devices simultaneously, and even connects to Echo Dot for voice command compatibility. In addition to all its tech features, the BOOM 2 is IPx7 waterproof – meaning it’ll hold its own in wet conditions from a light drizzle to an accidental drop in the crick. If all that isn’t enough, it connects with other Ultimate Ears speakers to create an immersive sound experience that won’t leave a single camper out – this is definitely a speaker for big groups who want big sound! If you have the budget for it, this is definitely one of the higher quality speakers that you can get. Related: Ultimate Ears makes a slightly smaller, more portable version of the BOOM 2 – the WONDERBOOM Bluetooth Speaker. Also fully waterproof and submersible, this is the perfect alternative (or companion) to the bigger BOOM. 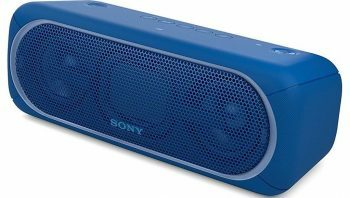 Description: The Sony XB40 Bluetooth Speaker is another powerful, hefty speaker that will keep you and your friends dancing the night away. This speaker features a 24-hour battery life, a multi-colored light show, and ClearAudio+ technology for deep base and perfectly balanced sound. Audiophiles will be pleased with the clarity of the sound, and every camper will be happy with music that keeps going all day and all night. While this speaker is perfect for big groups who want big sound, that means big weight. At over 4 pounds, this is not a speaker for a lightweight backpacker. Combined with it’s lower waterproof rating (a water-resistant IPx5), this speaker is best for car camping trips. That being said, this is one of the best quality speakers you can buy – if it suits your needs! It’s definitely like bringing the club with you on the go. Related: As one of the number one sound technology brands in the world, Sony offers a ton of other great speaker options. One of these is the Sony SRXB2 Bluetooth Speaker, a lighter, more affordable option with the same incredible sound. Description: The NYNE Aqua Bluetooth Speaker is your perfect companion for all water-based activities. This IPx7 speaker is about as waterproof as they come and fully submersible – although you don’t need to worry about submersion too much because the Aqua floats! This speaker is designed for wet activities and makes the perfect addition to any rafting, floating, or canyoneering trip, as well as any camping or backpacking trip with lakes, beaches, or rain in the forecast. In addition to its water features, the Aqua includes four different EQ presets to help you find your perfect sound. It comes in different colors for customizable style, and all this comes in a packable, affordable combo. It’s also available in both black and white colors. This is definitely one of the more uniquely-designed bluetooth speakers that you can get. The price isn’t so bad as well. This one is bound to be a pool party favorite. 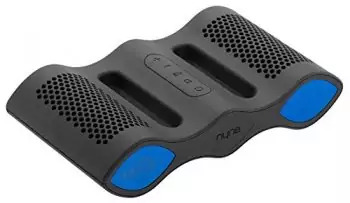 Related: For even bigger sound and bigger Bluetooth range, check out the NYNE Bass Pro Bluetooth Speaker – a splashproof speaker with a ton of punch. Description: If you’re looking for sweet, small, and simple, look no further than the JBL Clip 2 Bluetooth Speaker. This little gadget may be tiny, but sometimes the best things come in small packages. Combining a built-in microphone, IPx7 waterproof rating, and customizable style, this speaker is perfect for backpackers who want an easy way to play their music without a lot of added weight or concern over breaking. While the Clip 2 may not have the longest battery life or the loudest sound, it can be paired with other Clip 2 speakers to boost its noise – and it’s so lightweight, all your companions can bring one along! It’s clear that this speaker is designed more for personal use, perhaps while you’re chilling in your tent or hammock. This one is hard to pass if you’re looking for a truly portable speaker that’s a breeze to set up. 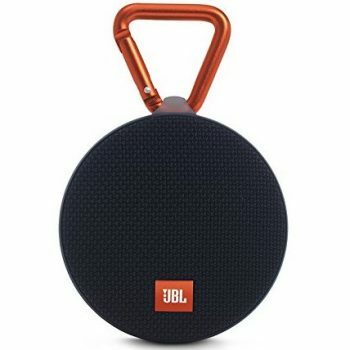 Related: If you’re less concerned about water but want a bigger sound, take a look at the JBL Clip+ Bluetooth Speaker – a splashproof variety of the Clip that offers high quality sound. 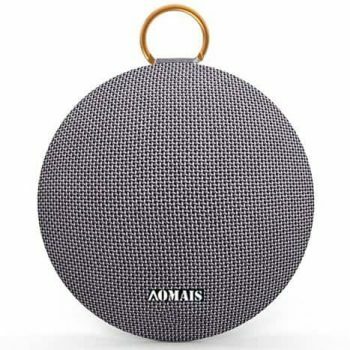 Description: The AOMAIS Ball Bluetooth Speaker is the final speaker on our list, and it’s certainly one of the best although coming from a relatively unknown brand. This speaker is made for people who care a lot about their music – and it’s 15W stereo sound is sure to please even the pickiest in your group. While it packs a ton of punch with studio-quality sound, it’s surprisingly lightweight and compact, weighing only half of a pound and measuring 5.5 inches in diameter. Not only does this speaker give the best in sound quality, but it’s fully waterproof, too. Rated at IPx7, feel free to get this one wet – it even comes with float accessories so you can keep it with you in the water worry-free. Looking at the price, it’s certainly one of the more budget-friendly models here. Whether you’re in the shower or in the middle of nowhere, this is one speaker that you will want to bring. 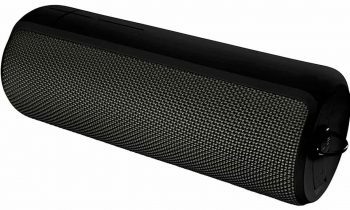 Related: For even more bass, check out the AOIMAIS Sport II Bluetooth Speaker – another IPx7 speaker with amazing sound. We’ve gone over eight of the best portable, waterproof speakers on the market. We’ve given you a list of tips on how to choose based on what you like to do. Hopefully, this helps you choose the best model that will go nicely with your home and outdoor music needs. So what do you think of our selection of the top Bluetooth speakers on the market? Do you know a different portable speaker that fits in our list? Let us know in the comments!